Hard to tell the content of each fabric huh? From left to right: 100% polyester fuzz stripe, 100% linen, 100% cotton stripe denim, 100% polyester brocade, 100% cotton fox print, ramie/linen solid weave. In general fabric and fiber content terms, Natural is plant or animal derived fibers. Synthetic fabric is man made or made from petroleum materials which are unsustainable and extremely energy and resource dependent; fiber is a ridiculously long slick filament with an initially cooler touch. 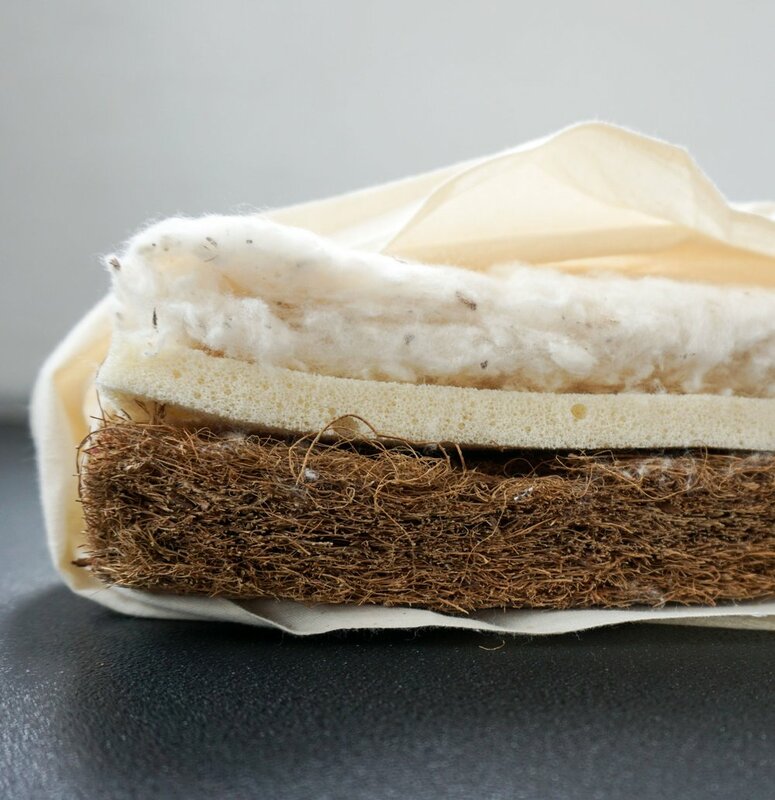 Regenerated is a plant source raw material that undergoes a chemical process to become usable fiber, a familiarly soft feel like Natural fibers but really a sibling of Synthetics . Natural wool is costly, so synthetics like acrylic and polyester are used to bulk up hand woven looks like this. Notice the difference in surface sheen of these velveteens. The one above is cotton fiber and the below is rayon. It’s hard to tell which is what when just looking at a fabric, but a good ol’ burn test will tell this tale. If a fabric burns and turns to powder, it's natural. If it melts and beads up hard like plastic and smells pleasantly candy sweet, then it's a petrochemical synthetic. Little trick I learned in fashion school that's solved a many fabric content mysteries. Whether the project is restoring a mid-century chair or new custom window cushions, the first question is: how will this piece be used? If this piece is sitting in direct sunlight all day, then cotton color fading may be an issue. If you have children and dream of a white couch, then I recommend a synthetic fabric for best stain resistance. If you want the cozy fuzziness of velvet, then perhaps select the cotton content instead of the rayon or polyester version. I personally prefer the feeling of cottons and natural fibers in my own home, but the need of the client’s end purpose generally dictates the final outer fabric. Our Critter Pattern Love Seat requests your attention with it's exquisite cotton print. Click through to order one today! When sourcing fabric, color, texture, and hand are my most key features. Color is the foremost detail people notice in any object. Texture is smooth like a printed sateen, bumpy like a slubby linen or fuzzy like cotton velveteen, and contributes to how you want to feel while experiencing your chair. The ‘hand’ is more important to me than to my clients, it’s how a handful of fabric crumples in my hand and moves when I shake it—it tells me the weight, quality, content, and how it will behave when I work with it. The look of different fibers and woven textues (left to right): Rayon velveteen, cotton canvas, linen/cotton, sueded polyester. I tend to be specific in my Ready to Order fabric choices since the art of design and environmental safety propels me. But sometimes..…. a synthetic fabric purchased at the local Los Angeles fabric district from a jobber (fabric resale middle man) is a modest ecological choice. A better choice is to better understand how each fiber affects our global environment and proactively decide. Cotton: Known for it's comfy, casual hand that gently softens and fades over time—similar to your favorite pair of jeans. It takes on brilliant dyed color, and the easiest to bleach in the case of white/light colors without degenerating. Common fabrics include denim, canvas, and velveteen. Of all natural fibers, cotton consumes the most water, pesticides, herbicides, and land. Traditionally, China and India are the largest cotton producers in the world, both are developing countries where the mistreatment of workers, chemicals, and environment are ongoing challenges. Biodegradable, sustainable. U.S. cotton crops continue to reduce their environmental impact. Why cotton is a better choice than rayon. Linen (aka Flax): It’s twisted, nubby, slub texture is unmistakable. The luxurious notion of real linen is frequently copied in synthetic versions that will never possess it’s true lustrous sheen and slinky hand feel. Epitomizes the feeling of nature and solid colors have dimension due to the woven texture. Compared to cotton, ”the production of linen requires less water and fares better in terms of water toxicity”. Biodegradable, sustainable. Rayon (aka Viscose): Although a cellulose fiber like cotton, rayon additionally requires a heavy chemical to process it into usable fibers. Rayon is not known for it’s strength and is used when an economical slinky hand or surface sheen is needed; commonly blended as the minority with dull cotton and linens. It’s manufacturing process is doubly extensive and chemical laden, and even more costly by requiring twice the growing time to that of cotton. It’s debatable whether this regenerated fiber is a synthetic or more natural due to it’s origin. Biodegradable. Energy use comparing fiber processing and production. Synthetics (aka Polyester and Nylon): Unmatchable with durable strength both in the tensile and color characteristics. 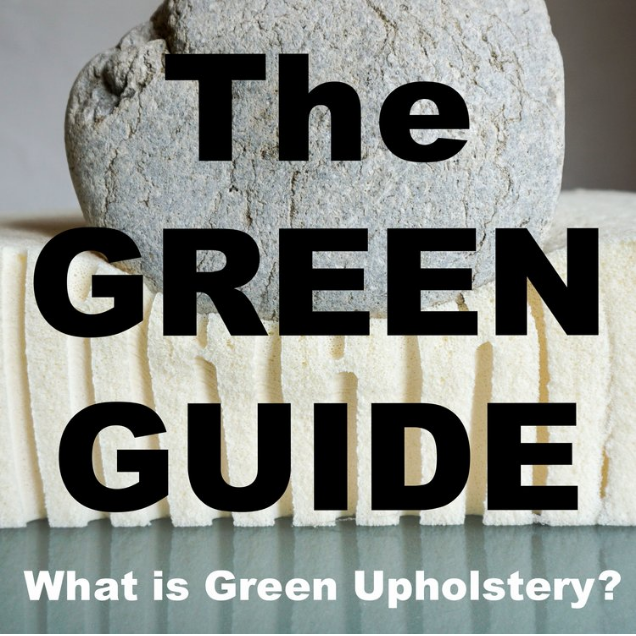 The Sustainable Furniture Council states "close to 60% of total global textile fabrication is polyester", and synthetic fibers are seemingly the most prominent fiber content in the mass consumer markets of clothing and home goods. It’s technology to mimic the look of cotton and silks is uncanny, but the huge consumption of toxic chemicals and water preside over all other fibers. Consider polyester a plastic, like all synthetics derived from petroleum, are not always recyclable and ultimately disintegrate into smaller bits, which mix into our water supply and dirt. Not biodegradable. Wool: Known for it’s fire smoldering properties in mattresses, this fiber is best used for it’s characteristically fuzzy texture. It’s ultimate purpose is heat insulation, as are all other animal derived protein fibers like silk. It adds loft and height to certain yarns and woven textures like brocades. Biodegradable. Click the couch to get in touch with me!